The jobless rate surprisingly fell to 1.8 per cent in September - the lowest level since last December - as layoffs subsided in the third quarter, preliminary official figures released yesterday showed. Employment growth remained strong, driven mainly by the services and construction sectors, despite slowing from the previous quarter. Private sector economists had expected the unemployment rate to stay unchanged in September from June's 2.1 per cent, a tight labour market notwithstanding. Citigroup's Kit Wei Zheng said the dip in the jobless rate in September reflected the latest round of tightening of the foreign worker policy that kicked in on July 1, as well as a "correction" of the unexpected rise in the jobless rate in June despite a strong sequential expansion in gross domestic product (GDP) in Q2. "We note that the unemployment rate has corrected to 1.8 per cent - below even the Q1 rate," he said. Mr Kit suspected there was "lagged hiring after the Q2 surge in activity", which was intensified by the shedding of foreign workers that forced employers "to draw down the resident labour force to meet their labour needs". Added OCBC Bank's Selena Ling: "Basically, the labour force participation rate is improving, but overall domestic labour market tightness is still prevalent under the current environment of foreign manpower curbs." Noting that the low unemployment reflected strong manpower demand, the Ministry of Manpower (MOM), which released the tentative labour figures in its Employment Situation Third Quarter 2013 report, said the seasonally adjusted jobless rate for residents (citizens and permanent residents) dipped to 2.6 per cent in September from 2.9 per cent in June. 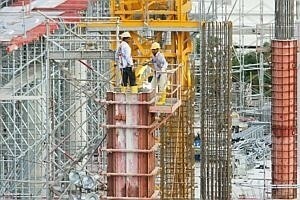 The unemployment rate for Singapore citizens slipped from 3.1 per cent to 2.8 per cent between June and September. "An estimated 48,300 residents, including 43,400 Singapore citizens, were unemployed in September 2013," the report revealed. "The seasonally adjusted figures were 56,000 for residents and 50,300 for citizens, down from 63,200 and 55,700 respectively a quarter ago." While jobs growth slowed to 28,100 jobs in Q3 from 33,700 jobs in Q2, Ms Ling said this could stem from "a combination of both shortage in manpower (that is, constrained labour supply) rather than (being) solely due to a moderation in economic or business activities". Total employment rose to 3,448,300 in September, up 4.1 per cent from a year ago. The construction and services sectors were the main engines of job growth in Q3, adding 10,600 and 14,000 jobs, respectively. There were more new construction jobs than Q2's 8,500, but fewer new services positions compared with the previous quarter's 22,700. Manufacturing created 3,000 jobs in Q3, up from 2,300 jobs in Q2, marking the second quarter of improvement since the drop in Q1 (minus 1,200 jobs). Redundancies fell to 2,600 workers in Q3, down from 3,080 in Q2. This offset a doubling in the early release of contract workers to 500 - the highest level since Q3 2011. The fewer layoffs were due to manufacturing redundancies falling to 1,000 in Q3 from 1,630 in Q2. The number of construction workers axed jumped from 250 to 300 over the two quarters, while workers laid off in the services sector rose from 1,200 to 1,300.